On Sunday, eight of us, plus Rumble the black labrador, set off on the ferry to Graemsay as the cloud broke to give us a lovely sunny day. We soon turned off the island road and headed along the marked coastal walk finding lots of interest even in this first section. 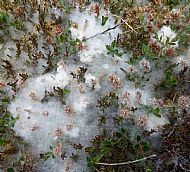 A Poplar Hawkmoth was spotted, we passed plentiful Creeping Willow covered in its fluffy seed, Northern Marsh and Heath-spotted Orchids, flowering Flag Irises, a solitary and rather battered looking Grey Willow, and a patch of flowering Brooklime in a dried-up ditch. Continuing around the very attractive shore we progressed past some sheets of Sea Campion and Lyme grass and even noticed some dogstooth stromatalites. We indulged in a coffee break, a first and second lunch break at various lovely locations and a final tea break on the beautiful maerl beach near Sandside where competitive groatie-buckie searching ensued before we wandered back to the boat. Over the day, we recorded over 70 species of plants, although without some of our serious plant experts we chickened out of identifying some more obscure sedges and grasses. All in all, it was a great day with much to enjoy on this peaceful small island.